After years of re-sheeting an unsealed road on a regular schedule, a council in rural NSW was ready for a better approach. “If we keep doing what we’ve been doing for the last 50 years,” said the Operations Manager, “we’ll go broke.” Hearing word that PolyCom Stabilising Aid was reducing maintenance for adjoining councils, the council to see for themselves. Under the guidance of a PolyCom project manager, the soil stabiliser was applied to the road during the council’s next maintenance grade. The road crew was skeptical – PolyCom was like nothing they had worked with before. How could such a small amount of product make a difference? You could barely see the blue granules before they were blade mixed into the soil. Returning to the site 65 days later to measure the results, the Ops Manager identified a 1m x 1m patch on the PolyCom treated road and swept the loose fines into a bag. Locating an area of the same size on an untreated section nearby, he repeated the exercise. 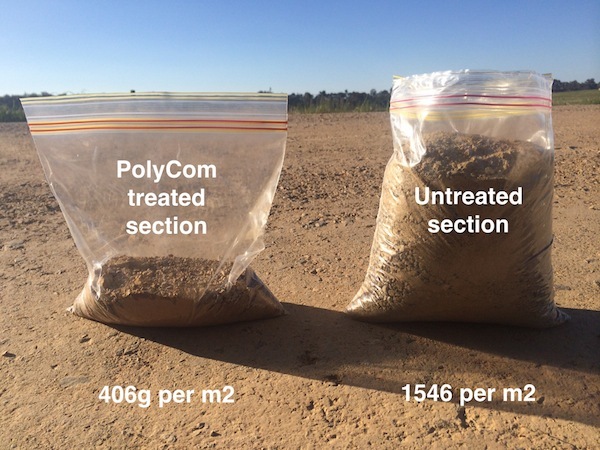 The bag on the left is the loose material collected from the PolyCom road after two months of traffic, where 406 grams was produced. In that time, the untreated road produced 1486 grams – almost four times more loose material than the PolyCom treated section. A road treated with PolyCom Stabilising Aid requires on average up to six times less maintenance than an untreated road. PolyCom can be added to the existing materials, which saves hauling heavy truckloads of new gravel to the site. The money saved with PolyCom allows Councils to treat more roads, enhancing the bottom line on all fronts.